Line a square dish with biscuits for base. 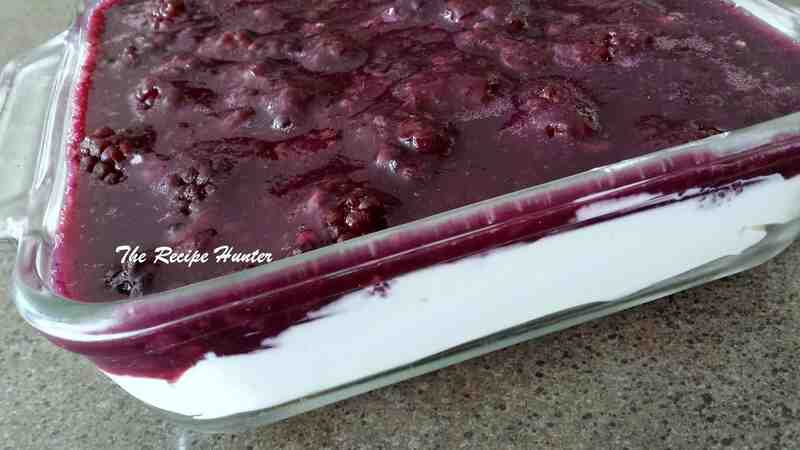 Place cream cheese, yogurt, and sour cream in a mixing bowl and beat until creamy. Add pudding and milk and beat until smooth. Scoop onto biscuits and chill. Top with fresh fruit if desired. Mix ½ berries (can also use ½ blueberries and ½ blackberries), ½ water, all the sugar and all lemon juice. Cook 3 minutes on low. Note: When I make this sauce, I usually do up to 10 pounds of berries, and then I have it for a year (or maybe less, as we use it a lot). Nice as gifts and also very very yummy on ice cream!! !